is a swinging front axle molded tubular beam with the split ends. Through the tides beams connected through the pivot axis with the lugs on the front bar of the core. By axial displacement and being rotated swing axle locking bolt located on the front bar. At both ends of the beams are retractable fists comprising bracket tubes welded together. In the tube 6 there are holes for snap-step 50mm. All the fist position coincide with the various tracks of example. wheel assemblies. For the bracket retractable knuckle ball bearing and 2 swivel pin bushings installed together with an embedded semi-axis front. wheel. The cavities and the bearing bushes are sealed by rubber rings below and above the felt ring and a rubber gland. On the pivot pin at the top of the slots are pivoting arms. The levers articulated manner transverse and fastened through push rods with a central lever fixed to the steering lever. This lever is connected through longitudinal traction with Uzbekistan and rotates on two sleeves placed in a flood beam. The length of the pushing and steering rods are adjustable. Angle of rotation eg. Wheel assemblies limited angle of rotation of the steering lever resisting cornering in tides axis beams. Hinges pushing lugs and transverse rods are made the same. The ball stud joint rotates in the polyamide and rubber inserts. Ear pressed to the head of the adjusting stopper finger. Finger longitudinal steering rod hinge rotates in the bushings made of steel, which are pressed against a spring preload adjusting stopper, to a head of a finger. The springs in the heads are thrust relates. ball studs, so that the forces acting on the rod is transmitted only one spring. Compressing the spring by means of limit stops, thereby protecting it from damage during severe shock. consists of the power steering gear, column. the steering wheel, the longitudinal traction and steering linkage of the front axle. The steering mechanism is configured as a worm gear interacting with the cylinder and the distributor. 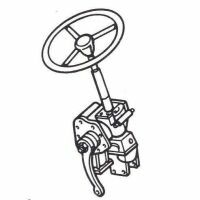 Serviceability steering hydraulic pressure is checked by determining by the pump, and then finding out the causes oil leakage in the distributor and the power cylinder and will prevent adjusted. valve.